Light when you need it, at the turn of a switch. No worries about batteries running out. Asymmetric beam puts more light on the road, where you need it. That also keeps glare out of the eyes of oncoming traffic. There is a reason why automobiles use integrated, generator-powered lights, rather than clip-on battery lights. Cars also come equipped with lights from the factory, but on most bikes, you have to install your own lights. This usually means connecting your lights to the generator hub. We sell Schmidt Edelux lights with connectors already attached to a 60 cm (23″) wire, but if you use a headlight from Busch & Müller or another brand, you will have to attach your own connectors. Even with an Edelux light, it makes sense to cut the wires exactly to the length you need (but not too short! ), rather than wrap extra wires around your bike’s fork blades. Attaching connectors to your headlight is not difficult. The whole process takes me less than 15 minutes. These instructions show how to solder the connectors to the wires. It’s even easier (and you get a better connection) with a special crimping tool. 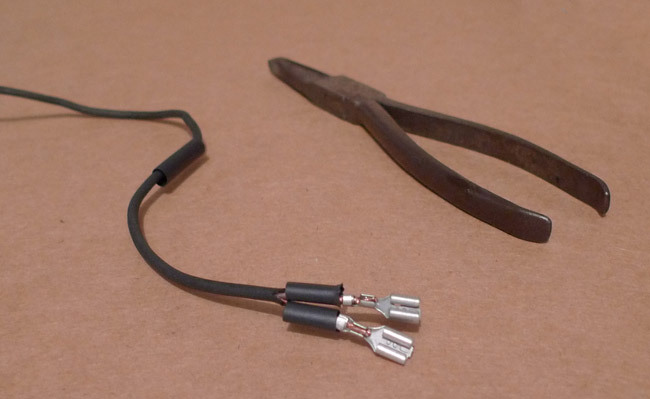 There are special crimping tools that allow you to crimp the connector onto the wire without soldering. If you have access to one and don’t like working with solder, it may be worth trying that instead. Before you start, it helps to visualize how the connectors fit together. The goal is to make them integral with the wire, so that you can pull on the wire, and the wire will not come off the connectors. Instead, the connectors slip off the tabs on the hub. Before you do anything else, slip a piece of large-diameter heat shrink tubing onto the wires (upper right arrow). If you forget that, you won’t be able to put it on later. Slide it out of the way, so it doesn’t accidentally get heated, which would shrink it in place. 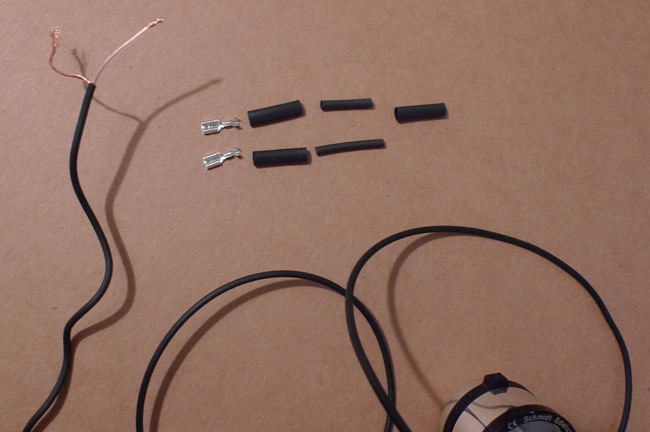 Slip the two small-diameter pieces of heat-shrink tubing onto the individual wires. Place the connectors on the wires and bend the rearmost portion over the wire and insulation (lower left arrow, photo above). In the photo above, only the right side has been bent, the left still sticks up. Above, both sides are bent over the wire. This holds the wire in place as you solder. Repeat with the next connector. 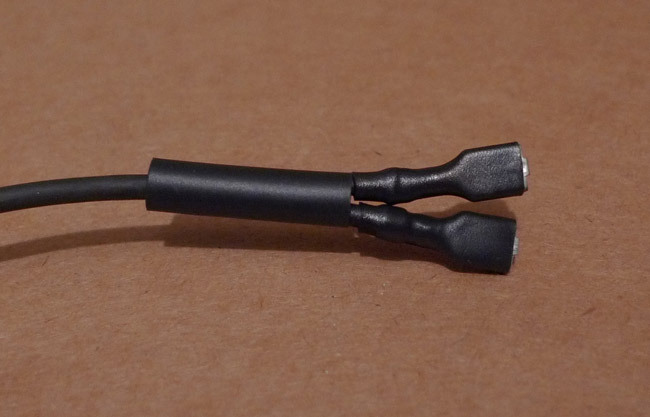 Then slip the small-diameter heat-shrink tubing over the end of the connector. The tubing should cover the bent-over end of the connector, so it should come down a little further than shown here. As you solder, the tubing will shrink from the heat, and you won’t be able to move it any more. 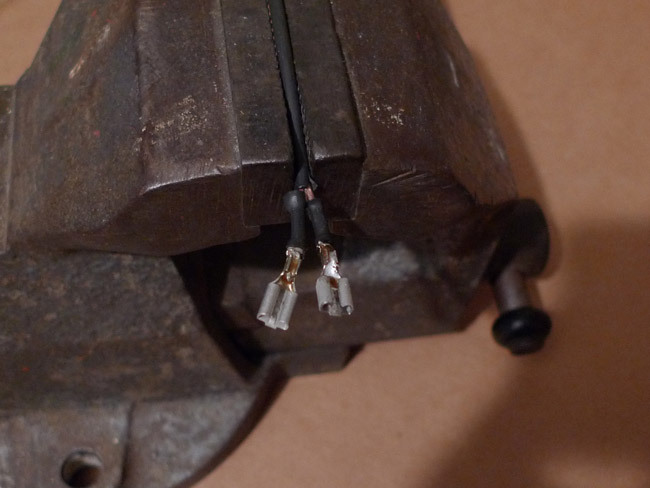 To solder the connectors to the wires, heat the joint with the iron, then the solder. Make sure the solder is joined to the connector. 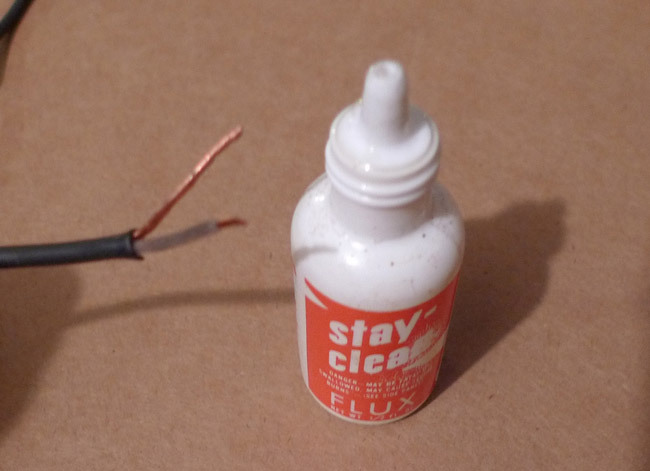 Simply melting a blob of solder onto the wire will not result in a reliable electrical connection. 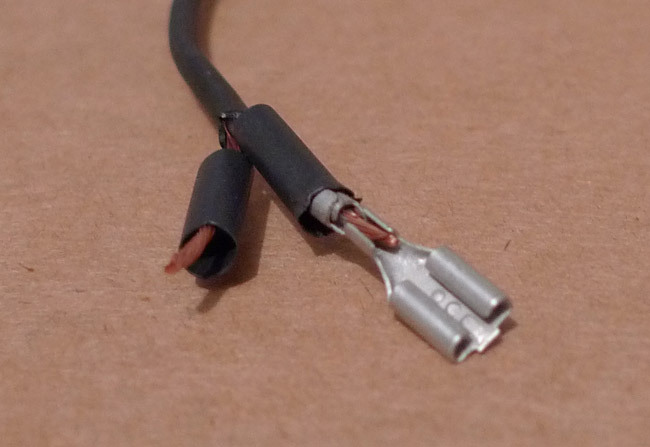 Heat is key here – the connector must get hot enough to form a firm bond with the solder. Be careful not to use too much solder, as it will run into the connector, which will make it difficult to plug it onto the tabs of the hub. To repeat: More heat, less solder. I took the photo above for illustration purposes only – don’t solder on a flammable surface! 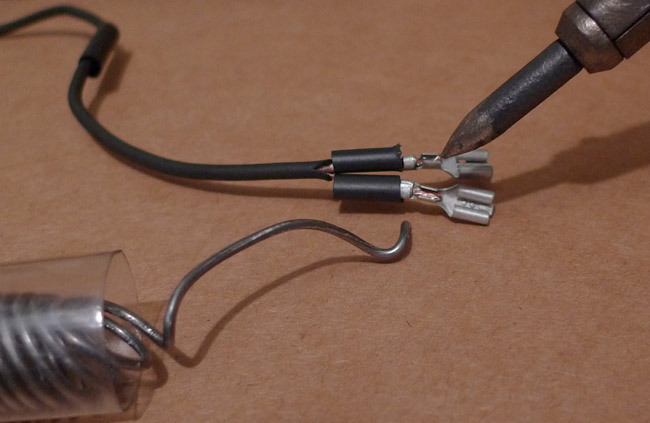 To solder, you need to hold the wire, while manipulating the iron and the solder. Unless you have three hands, it helps to gently clamp the wire in a vise. (Don’t clamp the connector, as the vise is a heat sink, and you won’t be able to heat the connector.) Above are the soldered connectors. You can see how the heat-shrink tubing now is firmly wrapped over the connector. This strengthens the connection, but we’ll make it even stronger in the next steps. Slide the large-diameter heat shrink tubing over the connectors. Use a lighter (or even better, a heat gun) to heat the tubing. It shrinks tightly around the connector and wire, making them almost inseparable. Now slide the last piece of heat shrink tubing down to the joint. Heat it, and you are done. Now the connectors will remain attached to the wires, even if you forget to disconnect the hub when you remove the front wheel from the bike. I still recommend unplugging the wires first, but it’s good to know that a careless moment will not leave you without lights for the remainder of your ride. Update: We now sell an automotive crimping tool that creates an even better connection. 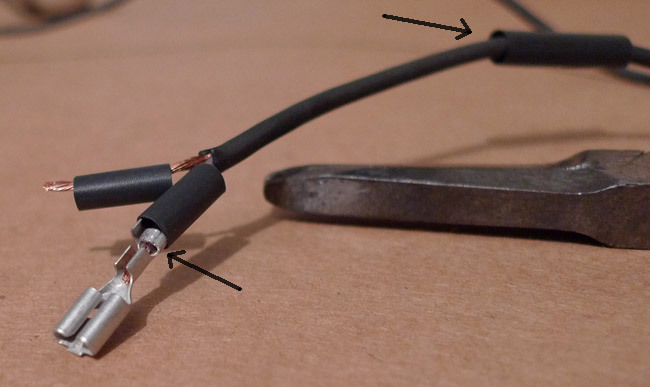 When you solder the connectors, the solder will go into the wire some ways, and at the end, it forms a stress riser where the wire can break. A crimped connection is just as secure, easier to install (no soldering!) and doesn’t have that stress riser. Thanks for this detailed how-to post. Very timely as I am about to wire up a new bike. So if your light is on the left side of your rack/wheel, you can run the wires directly up the left fork leg. Another good reason to get the Delux hub. 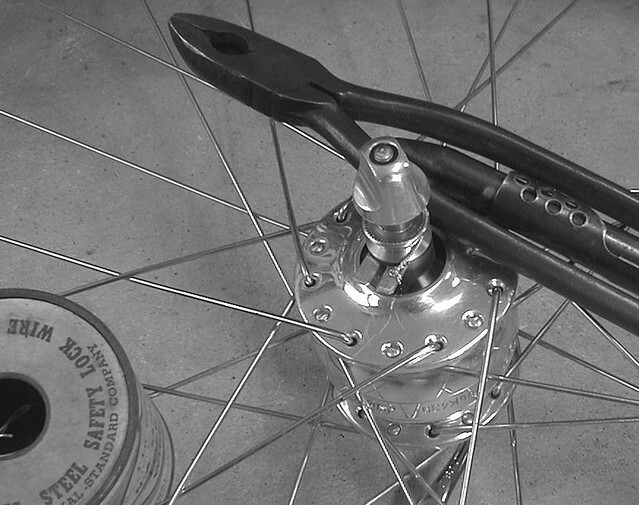 If it works, this is pretty neat, as it makes internal routing of the smaller-diameter wire through the fork leg and rack tubes easier, and the user only has to monkey with one spade terminal when changing a front flat. What do you think? 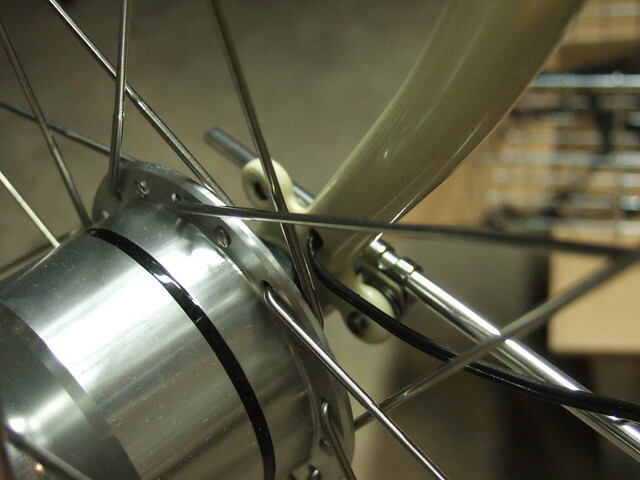 I have done something similar on my Urban Bike: I ran a short wire from the second tab to a fender attachment screw, where a circular connector fits like a washer under the drawbolt. I wish Schmidt would just connect the hub axle to one pole on all their hubs, in addition to providing the two tabs. Then there would be no need for home-made retrofits. I have suggested that, and they are considering it. Shimano does this; the return terminal is electrically continuous with the axle. I still prefer dedicated wire runs for the entire circuit, rather than rely on the frame for path flow. The problem with grounding the hub is that it is easy to end up shorting across the ground with a grounded headlight (such as the eDelux) and 2-wire connections. It is easy to fix (swap the wires at the hub) if the mechanic/owner knows what is going on, but a lot of people don’t and think that the equipment is malfunctioning. I saw this a lot on the lists with Lumotec headlights (which do have grounded mounts) and Shimano dynohubs (which have grounded axles). The easy way around that would be a little plastic sleeve that slides onto the unused tab on the hub. You remove it if you need both connectors, you leave it on if you use the axle and frame for the ground. Thank you Jan. This process intimidates me. I will print this out and keep it in my work area. If you mess up, you just cut off the connectors and start over (with new connectors). Just make sure your wire has an inch or two to spare. Firstly, the rear-most ears on the tip of the terminal are designed to work as a strain relief, to be crimped around the wire insulation, not the bare wire. This provides compression around the insulation, preventing the wire from getting pulled out of the terminal when solder isn’t used. (Notice how those rear-most ears are much longer? That’s to be able to wrap around the larger diameter of the wire insulation). Next, the bare wire strands get crimped between the smaller, middle ears. Lastly, the molten solder gets wicked into the crimped strand bundle. (By leaving those middle ears uncrimped in your photos above, their sharp square edges can eventually work their way through shrink tubing if there is a compressive force around the shrink tubing). Since the terminals are designed for solder-free crimping, the rear-most ears are dispensable if one chooses to solder. I often snip those rear-most ears off and just crimp the bare strands inside the center ears, followed by wicking solder. The solder is stronger than the strain relief ears, and visually, there is no bulge at the rear of the terminal; the finished, shrink-tubing work looks smoother and less bulging. With Schmidt’s co-axial wire, you only have one insulated wire anyhow. I use the “rear” ears for strain relief on that wire, but on the bare wire, you don’t have that choice. 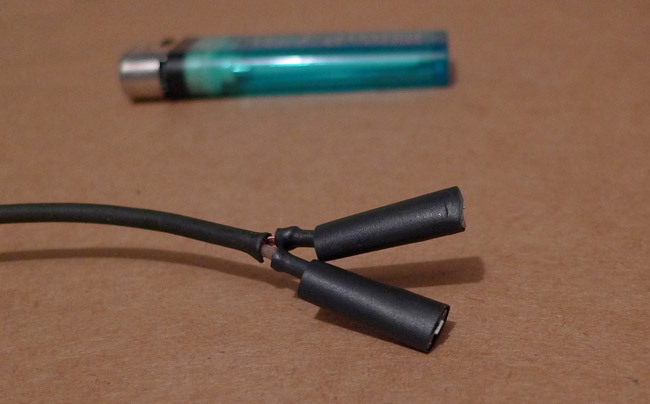 In any case, anything that gives your heat-shrink tubing something to grip is welcome, because I know that when I have a flat at night, I am glad if I just can open the brake and remove the wheel, knowing that the connectors will remain attached to the wire, and not to the hub! Great advice. The only thing I like to do in addition to these steps: I find the spade connectors a bit tight at first and much more likely to pull apart from the wires should one forget to disconnect. As such, I insert a small nail into the female end of the spade connector after assembling things and gently pry it open just a bit. The looser fit gives me a bit more peace of mind should I forget to disconnect the tabs prior to removing the wheel. Why does Schmidt choose to spec coax cable for their dynamos, anyway? The main purpose of coax wiring is to have a shielded ground for very low-signal electrical signals which may be sensitive to interference. 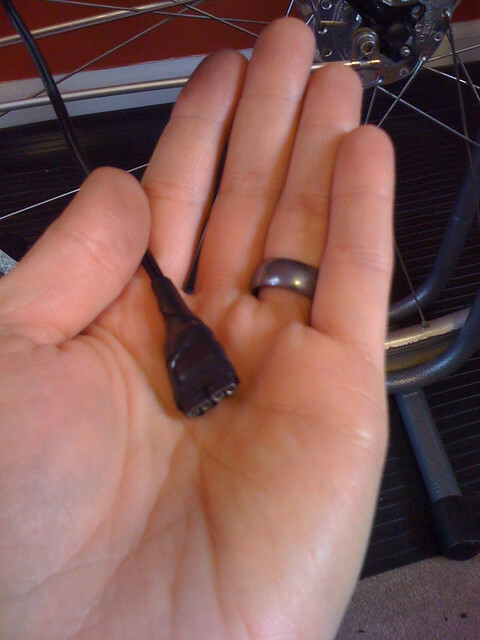 As for connectors, I think Shimano’s proprietary connector plug is nicely designed for the application: no soldering needed, it’s well sealed, and it allows you to just yank the wheel off without first removing the terminals. The coax cable is stronger and less likely to break if it gets snagged. 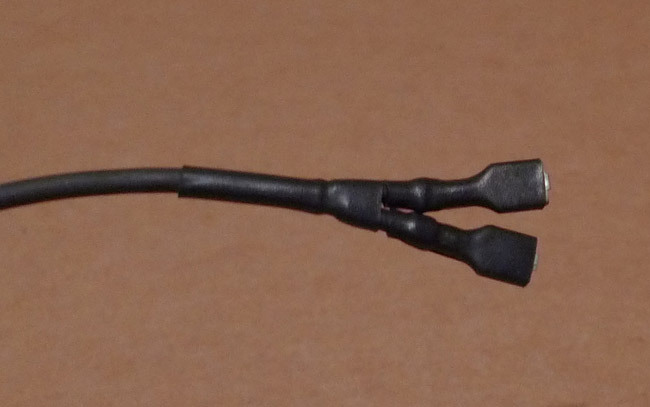 A two-wire cable usually will have one strand break, then the other. I have heard of riders whose Shimano connectors failed after a while. The spade connectors of the Schmidt always can be “restored” with a pair of pliers. I prefer the connector-less SL version myself, but you need a bike designed around it. I don’t intend to knock the SON system in any way, but the connectors can rust since the inside of the female terminals are not sealed from the elements and the galvanizing doesn’t hold up forever, so I can see them having a shelf life just like any other type of connector, Shimano or other. But this is where I particularly like the Shimano design: the wire/spade contact area is essentially sealed inside of a little greased box. And if it wears out, Shimano sells replacement connectors for $2-3. If you are near a bike shop who stocks the connectors, then Shimano’s solution may be fine. Out in the field, you can always get the Schmidt connectors to work again – as long as they remain firmly attached to the wires… The spade connectors “scrape” a clean surface every time you plug them in. If you want, you can put a dab of conductive grease inside, but I haven’t seen the need for that yet. I have used the Schmidt lights and hubs on all my bikes since 2000. No failure yet. Last year, I had bearings wear out on my first hub after about 70,000 km. I disassembled it (not recommended!) and saw that one bearing had moisture damage. That hub was made before Schmidt introduced the pressure compensation system, which avoids moisture being drawn through the bearings. So the replacement should last much longer. However, I want the glare in their eyes, so they see me, and as a kind of payback for the glare in my eyes, and the danger they constantly put me in. I prefer an approach of cooperation and partnership with other traffic. I don’t like other cyclists coming toward me on a narrow trail with blinding (or worse: flashing) lights, so why would I blind them? As for cars, it appears unwise to engage in a confrontation with somebody who weighs 10x as much as you do and who has 100x as much power. A good light is bright enough to be seen, but does not shine so much light upward that it affects oncoming traffic’s ability to operate their vehicles safely. Cars have low-beams for exactly this purpose. Finally, remember that any light that goes into the sky is wasted and doesn’t help you see the road ahead. Good write up, Jan. My one suggestion for improvement would be to forego the ZnCl/HCl flux unless you intend to wash it away or otherwise neutralize it . It can be corrosive if allowed to remain on the wire. Most electronic solders have a rosin flux inside the solder which is less reactive and soluble in alcohol. You are right, too much flux is not a good idea. I use a tiny dab of it, and it burns off when I solder. I’ll change the post to say that rosin flux is better. I do use a rosin-core solder, but I find that with the relatively large connectors, it burns off before I get a good solder joint. If there were electronics anywhere near the solder joint, then of course acid flux would be a bad idea. Can you explain why nearly every dynohub, I believe, has the wire connectors on the right? I much prefer my headlamp on the left side of the bike. Routing those wires up and over doesn’t make sense. Am I in the minority in preferring my lamp be on the side of the bike where opposing and passing traffic, and most of the roadway, assuming I am riding near the right side of the road, are located? Note: I live in the USA, so I pedal on the right side of the road. The latest-generation SON hubs can be mounted either way. It was only the old SON28 and SON20 that required mounting on the right, because running them in reverse (connectors on the left) could unscrew the cover of the hub. 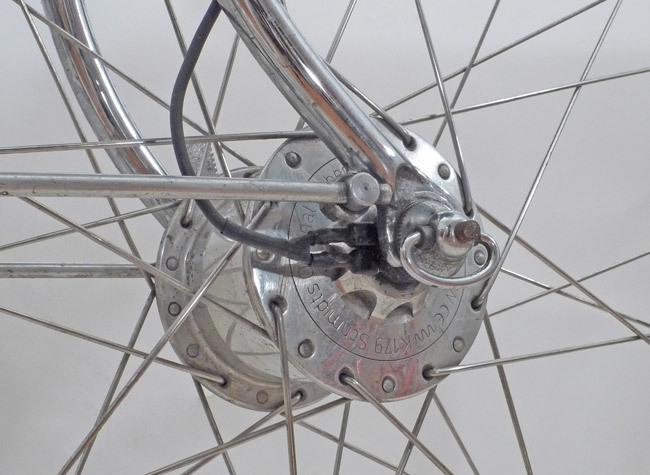 I don’t know the reason why they designed it so the wire has to come out on the right, and not the left – except that in Europe today, most bikes have the light mounted on the fork crown, so it doesn’t matter on which side the light is. I too used to solder as well as crimp spade connectors such as these. I changed this practice after an autoelectrician (who wired up mostly rally cars) told me that soldering can cause a fatigue failure in the wire. 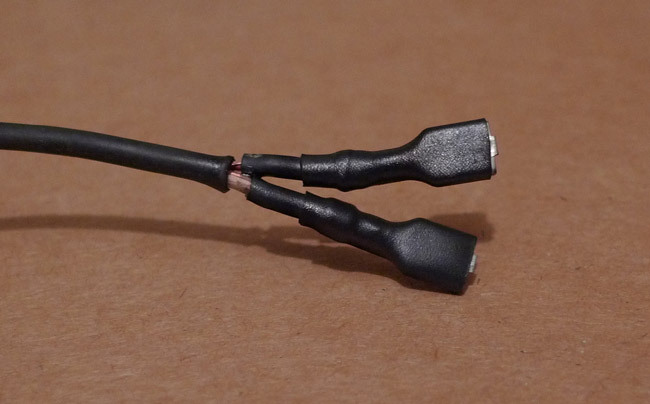 A multi-core wire will wick solder along its length, leaving a stiff, solder filled stub protruding from the connector which transitions to a flexible cable in almost zero length. It’s at this transition point where the wire will repeatedly flex with vibration. The use of heat shrink will ameliorate this situation to a degree. By using an appropriate crimping tool I have not had issues with connectors pulling off and the electrical connection remains good after years of use. Scott, you make a good point. In practice, this hasn’t been a problem even after many years of fast riding on relatively rough roads. It appears that the transition (and stress riser) between solder and “flexible” wire is stiffened with all that heat shrink tubing, so that the flex occurs further up the wire, where you only have “flexible” wire. I still want a hub+light combination with an Apple MagSafe-style power cord connector. I like that one, too, but have you tried it when it’s full of dirt? Any dirt that contains iron sticks to magnets… which may cause a poor connection.